iMindAmbiEnce is a unique application that builds environments of sound called Soundscapes. Soundscapes can be used for Meditation, Christian Soaking, Relaxation or as an Ambient Sleep Aid. 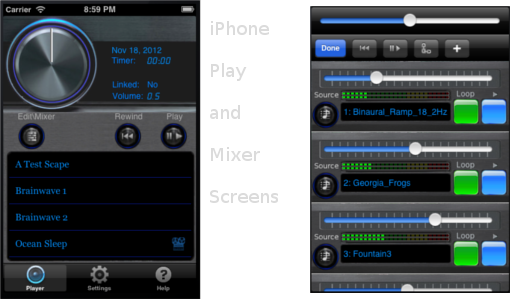 The application allows mixing of 1 to 6 channels of sound creating the perfect blend and volume to each persons taste. iMindAmbiEnce is an advanced tool for brainwave entrainment meditation giving the user total control over the atmosphere and ambiance of the session. Soundscapes can be linked to allow complex transition into deeper states. You can link Soundscapes to any of the 6 channels playing, whether it be a spoken guided meditation or a brainwave track. As the linked Soundscapes play, the next link in the chain is loaded and played without any user interaction. The last link can play all night or be stopped with the included timer. Brainwave Entrainment Soundscapes with binaural beats, isochronic tones and solfeggio frequencies can be built to the exact needs of the user and mixed with nature sounds or any other sound in the library. iMindAmbiEnce can be used to aid in relaxation and sleep by mixing rhythmic sounds that calm and sooth your mind. You can create an ambient sleep zone around you to block out the world while you rest. You can build your sound library with items such as guided meditation or sleep selections through additional Sound Packs. New material will aways be available so the selections never get old. The default sound pack contains a complete set of Binaural and Isochronic tones for Gama, Beta, Alpha, Theta and Delta frequencies. 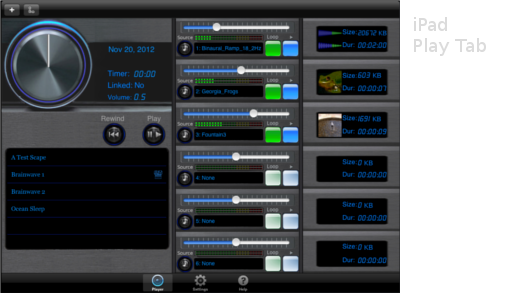 The default sound pack also contains a host of nature sounds that can be mixed for sleep or with the brainwave tracks. Solfeggio mixes are included for users interested in experimenting with the Ancient Biblical tuned frequencies. Whether you want total control over your sleep or deep meditation iMindAmbiEnce is the perfect match. iMindAmbiEnce now has a Free Soundscape section where new sounds and packages are periodically added to give the user some additional sounds and guided meditations. The Free Soundscape section now contains the default sound packs also. The default sound packs are now divided into Sleep, Brainwave1 and Brainwave2 for separate download. Users that want to use the application for sleep only, can download the Default Sleep sound pack without filling their storage space with brainwave selections. In the 1.5 release of the application, the footprint of the app was reduced from 152 meg to under 50 meg to allow for cellular downloading of the application. All Sound Packs have been reformatted to allow for cellular download. Your old Sound Library will be retained in the upgrade. However if you want to reduce the storage footprint on your device, you can reinstall the application and enjoy a much smaller storage and memory footprint. Bug Fixes: Prevent install of Sound Packs when the device does not have enough space to uncompress the package Fixed Soundscape delete that caused the play screen table to get out of sync Reduced memory usage iMindAmbiEnce is now lighter and faster and is able to operate on low memory devices with the reduced memory and storage footprint. 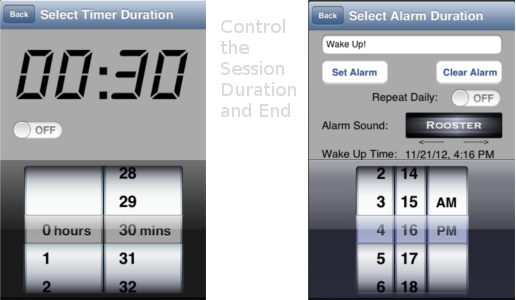 You can control every aspect of your Meditation or Sleep sessions with iMindAmbiEnce. Tweak volume levels and playback of 6 channels of selectable sounds or brainwave tracks using binaural, isochronic and solfeggio backed Soundscapes. iMindAmbiEnce provides binaural beats, isochronic tones and solfeggio frequency tracks which can be mixed and linked together to provide complex and deep meditative states. iMindAmbiEnce can be used to get into that focused state to Meditate on the Holy Spirit. Guided meditation tracks are available to help the beginner relax and focus. iMindAmbiEnce is packaged with a set of nature sounds recorded from around the World. 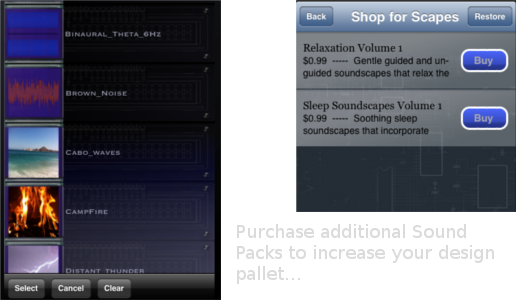 Additional Sound Packs can be purchased to build a customized pallet of sounds. 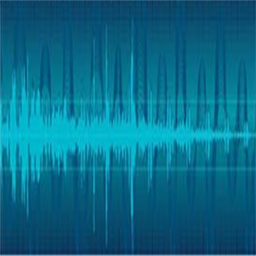 Soundscapes can include up to 6 combined sounds mixed. Individual channels can be looped, played once or linked to another Soundscape providing hours of changing meditative sessions. iMindAmbiEnce was developed by Resaca Graphics Inc. The use of iMindAmbiEnce may result in changed brainwave frequencies, which can change how the user experiences and interacts with his/her inner and outer worlds - "alltered states of consciousness." Do not drive or operate any heavy equipment while listening to or using the iMindAmbiEnce application. By downloading, installing and using this application and/or listening to the audio it generates, you explicitly accept full responsibility for any and all effects of its use. Resaca Graphics Inc. make no medical claims to any benefit or effect of using this technology. Copyright 2012 Resaca Graphics Inc.